HTC just made the One A9 official, its latest “One” phone that should take us through the end of the year. The phone is available globally during the first week of November. Of course, carriers and locales will announce their own plans for launching it, with pricing. HTC is also releasing an unlocked version on HTC.com as a SIM unlocked phone, with an unlockable bootloader (warranty stays when unlocked too), that should work on any carrier will work on AT&T and T-Mobile. It will be up for pre-order today on HTC’s website and will ship November 6. During a promotional period, the One A9 will be available starting at $399. NEW YORK – October 20, 2015 – HTC today unveiled the latest addition to the award-winning HTC One family, the HTC One A9. Melding the best of HTC’s acclaimed design and innovation with the latest from Google’s Android, this is a stunning, no-compromise smartphone that stands out from the crowd. Built for people who want a better choice, the HTC One A9 is a smartphone that combines striking design on the outside with the newest features of Android 6.0 Marshmallow with HTC Sense on the inside to create an unrivaled smartphone experience. Your best camera is the one you use whenever the moment strikes, so it should be able to capture stunning shots in any situation. The HTC One A9’s front and rear cameras, coupled with powerful yet simple editing tools, mean epic photos and videos are only a tap away. Its main 13MP rear camera features Optical Image Stabilization (OIS), which automatically minimizes hand shake and corrects vibrations to give you a crystal-clear picture every time. Meanwhile, the front UltraPixel camera delivers the best self-portraits in any lighting condition, using HTC’s UltraPixel sensor to capture 300% more light than conventional smartphone cameras. With the HTC One A9, no detail is too small. Offering an optional Pro mode to capture the perfect photo without being a photography expert, you can also save photos using RAW capture – a tool used by professional photographers – for an unmatched level of detail and post-shot editing flexibility. Or you can keep things simple with Photo Editor’s one-button enhancement feature, which automatically brightens colors and sharpens edges for unbelievably clear and crisp photos2. Sometimes a still photo just isn’t enough. With the HTC One A9’s Hyperlapse editing tool you can speed up your videos to 12 times as fast for a dramatic time-lapse effect, creating an immersive video that perfectly captures the moments that matter. Speed through your video or use capture mode to edit in slow motion, highlighting those unforgettable memories. Or use HTC Zoe to easily and automatically mix your best shots and videos into one professional-looking highlight reel that can be shared with friends and family to tell the story of any moment from every angle. Game changing audio has always been core to the HTC One family – the HTC One A9 delivers amazing sound quality, with HTC BoomSound™ integrated into the headset combined with Dolby Audio™ surround technology3, delivering immersive, vibrant sound that matches a live experience in your headphones by taking high-resolution audio to the next level4. With a built-in DAC that delivers audio at 24-bit, 192KHz quality – better than CD quality – it provides a richness and depth like you’ve never before heard from your music collection. A powerful high-output headphone amplifier, with double the output of other handsets, provides more power and dynamic range so you can hear every nuance of your favorite music, videos and games. Optional high-resolution audio certified HTC Pro Studio Earphones deliver both noise isolation and truly immersive sound. The first non-Nexus smartphone powered by Android 6.0 Marshmallow, the HTC One A9 brings Google’s latest innovations and the simplicity of HTC Sense right out of the box. Combined with a multi-directional fingerprint scanner, Android Pay makes purchasing items as secure and as easy as “tap, pay, done.”5 Google’s Now on Tap feature also intuitively provides contextual information about whatever is on your screen – look up reviews for a movie from a text, hear a song mentioned in a blog post, or book seats at a restaurant from an email, all at the press of the home button. With so many new features, the HTC One A9 has also been designed with all new power-saving capabilities to maximize battery life. Doze automatically turns off power hungry applications when your phone is left idle, such as when charging overnight, while App Standby knows when an app open in the background isn’t being used and shuts it down until you need it again. In addition, the phone’s new processor, AMOLED screen and support for the optional HTC Rapid Charger 2.0, for up to 75% faster charging6 are all optimized to maximize battery life throughout the day7. In real terms this means, for example, that you can play 12 hours of HD video on one charge. 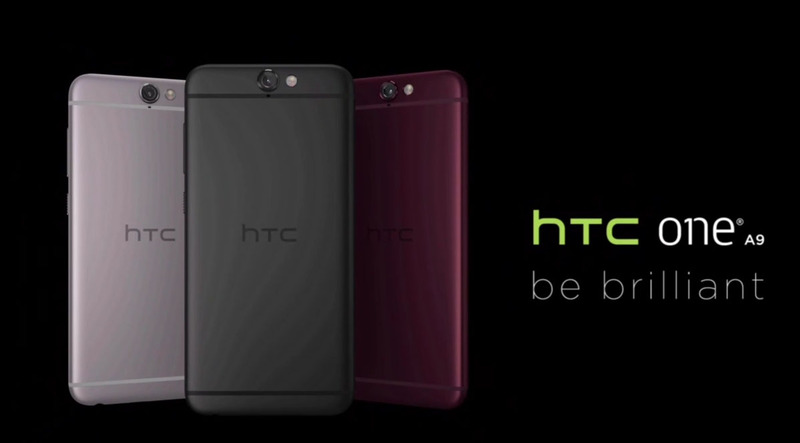 HTC is Announcing the One A9 Today, Watch the Event Live Here!